Illaunrossalough is in the civil parish of Kilcummin. The civil Parish corresponds with the following Church of Ireland parish of Kilcummin, Galway West. In general the civil parish and the Church of Ireland parish are the same as is the case in the Kilcummin Oughterard area. This townland is also known as Ilaunrughlogh. Illaunrossalough is on Logainm.ie: Illaunrossalough. A small island covered with rough pasture, part rock, situated S.E. of Carrigbwee No. 2 and W. of the townland of Turlough. In the sea, it belongs to the townland of Turlough. Tithes were a tax on agricultural produce which was payable by the occupiers of agricultural land. They were the main source of income for the parish clergy of the Church of Ireland (the largest Protestant church and the church established by law). However, in many parishes a large part of the tithes were ‘appropriate’, which meant that they were payable to a bishop, cathedral chapter or other ecclesiastical recipient, or were ‘impropriate’, which generally meant that they were payable to a local landowner. The parishes used in the Tithe Applotment Books are civil or Church of Ireland parishes, which often differ in name and territory from Catholic parishes, Acts of Parliament of 1823 and 1832 provided for the conversion of tithes into a fixed charge on land, and specified the average price of wheat or oats in the parish in the seven years before 1821 as the basis on which the tithes would be calculated. They also extended the application of tithes to pasture, where previously they had been levied only on tillage. This change in the law resulted in the valuation of individual holdings in almost all parishes containing agricultural land, in order to assess the portion of the tithes for which each occupier of land would be liable. The apportionment was recorded for each Church of Ireland parish in a Tithe Composition Applotment Book. The information was collected and two Parochial Commissioners calculated the amounts, one of who was appointed by the cess-payers of the parish and the other by the relevant Diocese of the Church of Ireland. This procedure was carried out in over 2,500 parishes between the years 1823 and 1837. The Tithe Applotment Books are in a variety of formats, from a few pages sewn together to elaborately bound volumes. In most cases they are written in manuscript throughout, although some consist of manuscript entries on printed questionnaires. The information in the books is broadly uniform and generally includes at least the name of occupier; the size of holding, the valuation and the tithe payable. In some cases more detailed information is provided. Some volumes have maps and most have certificates and correspondence attached. The sub-divisions of the parish were recorded. Some of these subdivisions, such as ploughlands, ceased to be in official use after the six-inch survey of the Ordnance Survey was completed in the 1840s. Only productive land was subject to tithe, and the books usually distinguish between this tithable land and untithable land such as roads or mountains. Tithable land was in some cases classified by quality, and a money value was given to each class. In some cases the proportion of tithe payable to the rector, vicar or lay proprietor of the tithes was set out. The column for observations was sometimes completed, with information about commonage, for example. There are a number of other points that should be noted. The acreages given in the Tithe Applotment Books are in Irish or Plantation measure, which is 1.62 times larger than statute measure. Only occupiers of land at the time of the tithe composition are recorded, so not all heads of households living in a parish at the time are included. Only rural areas are systematically covered, although inhabitants of towns who held plots of cultivable land are included. The equivalent tax in urban areas, Minister’s Money, has left few records. The Tithe Applotment Books are an important source of information for a wide variety of researchers of pre-Famine Ireland. They provide the first surviving national list of the occupiers of land, and are used by genealogists as a partial substitute for returns of the 1821 and 1831 censuses of population, which were destroyed in 1922. They also record information on the quality of land, and provide information on pre-Ordnance Survey territorial divisions, some of which were not recognized after the 1840s. No information given for Illaunrossalough. Area: 2 acres, 1 rood & 13 perch of Land. Occupiers of the Land: Bryan King, Colman Nee, John Feenaghty, Martin Halloran, Peter Conneely, Thomas O’Donnell, John Walsh, Anthony Mannion, Michael Joyce, James Walsh, Michael Maude & Thomas Nee. Annual Rateable Valuation was £0 12s 0d. Each tenant paid 1 shilling. Immediate Lessor: The Directors of the Law life company. In Ireland the Poor Relief Act of 1838 divided into districts or “unions” in which the local taxable inhabitants were to be financially responsible for all paupers in the area. In 1898 the Poor Law Union was adopted as the basic administrative division in place of the civil parish and barony. Further subdivision into 828 registration districts and 3,751 district electoral divisions followed. Townlands were not arranged according to these divisions with parish and barony retained as a means to make comparisons with records gathered before 1898. The extension of the existing Poor Law Commissioners’ powers to Ireland, with the appointment of Assistant Commissioners who were to implement the Act in Ireland. The division of the country into Poor Law Unions based on Irish electoral divisions which were themselves made up from townlands. The creation of a Board of Guardians for each Union, two-thirds of whom were to be elected, the other third to be appointed ex officio. The setting up of a workhouse in each Union. The collection of a local poor-rate to finance the system. Initially, 130 Unions were created, based upon 2,049 electoral divisions. The divisions were composed of townlands, a peculiarly Irish unit, traditionally of 120 Irish acres in area. (Between 1848 and 1850, an additional 33 Unions were created by subdividing and reorganizing the boundaries of some existing Unions, particularly in the west of the country. Boards of Guardians were elected annually on 25th March. Only rate-payers were eligible for election, which effectively disenfranchised most of the native Irish who were usually tenants at this time. Rate-payers were allowed between one and six votes depending on the size of a valuation of their property. A townland is one of the smallest land divisions in Ireland. They range in size from a few acres to thousands of acres. Many are Gaelic in origin, but some came into existence after the Norman invasion of 1169. 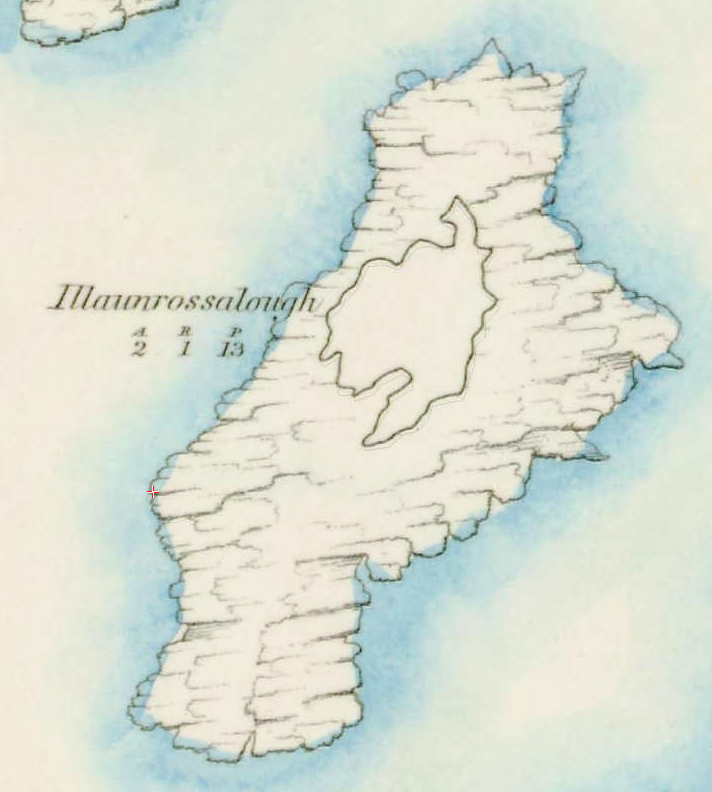 Illaunrughlogh is in the townland of Turlough. No one living on the island. It is located at 53° 22′ 38″ N, 9° 38′ 51″ W.
You can use this link to view a map of archaeological features. This link brings you to a website wherein you will have to search for you townland. This page was added on 28/06/2016.